Maintains operating strobe appliance temperature with external temperatures to -70°F (-57°C). For use in areas where temperature or environmental conditions exceed the operating range of fire strobe signaling devices. 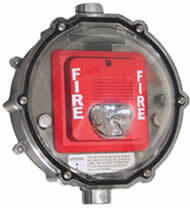 Protects ADA Compliant strobes to UL 1971 standards. The thick, clear polycarbonate cover is UV-stabilized. Enables ADA Compliant for visual fire protection systems where freezing temperatures or other harsh conditions exceed the operating limits of strobe signal devices. 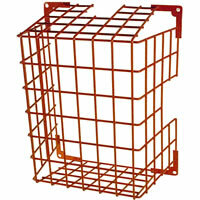 Enclosure rated to NEMA 4X Standards. Heater assembly rated to -70°F (-57°C). UL/cUL ambient rating -70°F to 120°F (-57°C to 49°C) indoors or outdoors. Prevents build up of snow on the unit or entry of moisture in wash-down areas to assure that strobes remain clearly visible. Fan runs continuously to maintain a uniform temperature inside the enclosure. 110 VAC heater units cycle as required to maintain the correct range of operating temperatures. Polycarbonate backed by a 3-Year warranty against breakage in normal use, one year on electronics. cUL Listing is for UL 1638 strobes only. CSFM requires local approval only. Now there is a way to protect your signaling device located where temperature or environmental conditions exceed the suggested operating range. 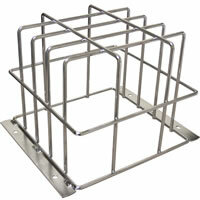 This protective cover with heater assembly for strobe appliances, is UL/cUL Listed to NEMA 4X Standards. Thermostatically controlled heater and a continuous duty fan maintain a uniform temperature in the cover when located in a cold environment. Applications include, but are not limited to, refrigerators, freezers, meat packaging plants, arctic environments, ocean rigs, slaughter houses, etc. UL/cUL Listed down to -70°F (-57°C). Now there is a way to protect your signaling device located where temperature or environmental conditions exceed the suggested operating range.